Once upon a time, only companies that specialised in TV offered any real kind of TV channel choice. Now you can get a wide selection of TV packages from leading broadband providers while TV providers have begun bundling their services with broadband packages to give consumers the most value for their money. Currently the biggest players in the TV comparison market are Sky, BT, Virgin Media and TalkTalk. Below we will look at the TV packages offered by each to help you find the best deals out there. Sky's Entertainment package includes a wide variety of pay TV channels, including Sky Atlantic, FOX, Comedy Central and dedicated music and documentary channels like Discovery and Nat Geo Wild. If that's not enough, you can add and remove 31-day packs for Box Sets, HD or kids' content. Sky’s Multiroom option — which you can add for a fee — is also great as it allows you to enjoy Sky channels in different rooms in the same household at the same time. Virgin Media offers a wide variety of bundles to suit every budget or need. Their current bundles are Player, Mix, Full House and VIP, each designed with a wide selection of channels (including HD), on-demand and catch-up TV services. Player is an entry-level option, while Full House and VIP are high-end packages, each offering Sky channels. Every TV package from Virgin comes with their new set-top box, the V6, which has 1TB of storage and can record up to six programmes at a time. BT TV comes in three TV packages: Starter + BT Sport, Entertainment Plus and Total Entertainment. All three come with at least 80 channels, and two of the packages — Starter + BT Sport and Total Entertainment — include BT Sport. Subscribers to other packages can add BT Sport on a monthly basis for a small fee. All packages have the option to add on Sky channels. There are now TV packages specially designed for sports fans, movie lovers and kids. Most of the time you'll find packages that offer the channels you want in related genres. In some cases you can mix and match them into bundles or subscribe to individual channels to create your own personalised TV package. Sky’s Sports Pack is inarguably the most popular of its kind, offering live football, F1, rugby union, cricket golf, golf and many other sports. Sky Cinema, meanwhile, lets you enjoy 11 channels showing blockbuster hits, plus a new premiere every day. Either of these packs can be added to any Sky package, as well as packages from most other providers. TV and broadband bundles truly are a godsend for consumers looking to consolidate their monthly outlay on entertainment and internet access, which often tend to be quite expensive when taken separately. By picking a TV and broadband bundle, you’ll be paying fewer bills and potentially saving hundreds of pounds a year. 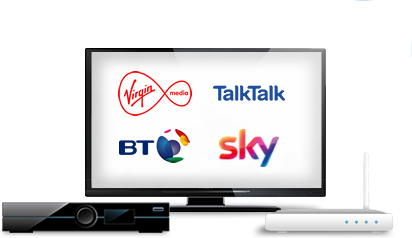 All the top TV and broadband providers now offer simple and affordable TV and broadband bundles. TalkTalk, for example, has a TalkTalk TV bundle that comes with a super-fast broadband connection, line rental and a free YouView box for a single cheap monthly fee.